We will show how Ms. Jones and Ms. Hernández walk through the process of designing this activity while integrating the targeted benchmark. Ms. Jones and her teaching assistant (TA), Ms. Hernández, are responsible for developing learning activities that meet the needs of diverse learners and address the Illinois Early Learning and Development Standards (IELDS). Ms. Jones knows most children in her class will meet the standards and benchmarks. However, she will have to make adaptations for those children who need more individualized instruction. Ms. Jones is the state-licensed head teacher in a monolingual classroom of 15 children with diverse ages (3–5 years old) and learning needs. 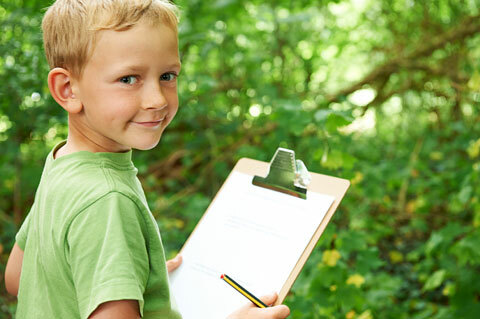 There are 10 typically developing children with age-appropriate skills and behaviors in the class. These children act as peer models for the remaining children in the class. Three children, Raúl, Luis, and Esther, are dual language learners whose home language is Spanish. They started school with little understanding of English. Ms. Jones’ TA, Ms. Hernández, is bilingual and uses both Spanish and English in the classroom. Two children, Joey and Hailey, have special needs requiring an individual education program (IEP). Joey has significant speech delays and is learning to use an adaptive and augmentative communication (AAC) device. Hailey has cerebral palsy (CP) resulting in significant motor delays, especially on the left side of her body. She uses a wheelchair for mobility. On occasion, some children exhibit challenging behavior during small group lessons. Ms. Jones would like to implement strategies to address challenging behavior in the classroom. Ms. Jones’ district uses a state-approved developmentally appropriate curriculum. Ms. Jones and Ms. Hernández perform universal screenings three times per school year (fall, winter, spring) for preschool children. This lesson addresses a primary benchmark. A secondary benchmark is included to offer ideas for addressing an additional benchmark within one lesson. Teachers are encouraged to be creative in thinking of ways to address multiple benchmarks within one lesson. Counting out an appropriate number of pennies to pay for a desired item in the classroom shoe store (e.g., if a child is given a price tag with a “2” on it, the child can count out two pennies). This activity lasts 10 to 12 minutes. 6.B.ECb: Show understanding of how to count out and construct sets of objects of a given number up to 5. To introduce the small-group counting activity, Ms. Jones models the task during large-group time. She places the price tags and purses full of pennies on the floor. She chooses a price tag and carefully selects a child who is proficient in counting to model the activity. 1.A.ECb: Respond appropriately to questions from others. During the large-group introduction and small-group activity, Ms. Jones and Ms. Hernández pose questions to children so they have multiple opportunities to appropriately answer questions. Sample questions are provided as examples throughout this lesson plan. The child counts pennies out loud as he removes them from the purse and places them on the price tag. Ms. Jones dismisses children to centers. 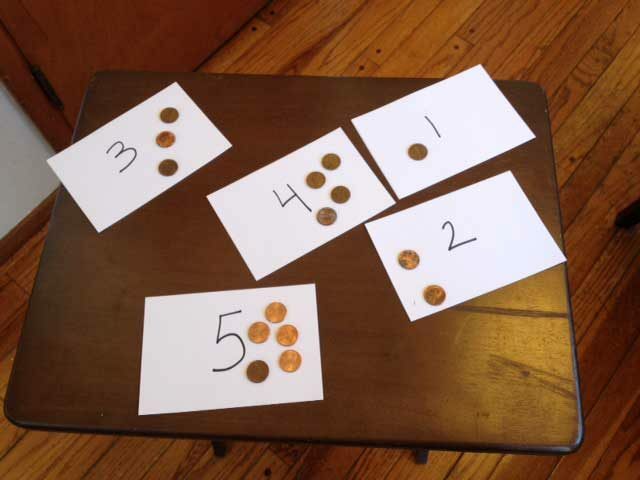 One of the centers is the penny-counting activity at a table. The assistant, Ms. Hernández, facilitates this center. On the table are price tags labeled with prices 1 through 5 and coin purses filled with pennies. Each child has five price tags (1–5) and one coin purse. Ms. Hernández coaches children to count out the appropriate number of pennies from purses to correspond to the number on the price tag. When a child completes one price tag, Ms. Hernández prompts the child to choose a new price tag and count out the correct number of pennies. This center activity is available for several days or weeks, until Ms. Jones determines that most children have had enough time to practice counting and have experienced success with the activity. While Ms. Hernández provides direct instruction for the children the first time they attend the center, on subsequent days children can use the center independently. Ms. Jones and Ms. Hernández monitor children’s work and provide assistance when necessary. On a later day the center is open, Ms. Hernández identifies a child, Johnny, who could benefit from additional help counting. On the final days the center is open, Ms. Hernández completes a data sheet documenting children’s progress; she includes comments about assistance or adaptations that children needed during the activity. Ms. Jones will include this information in children’s portfolios. Ms. Jones and Ms. Hernández also will use information to inform future lesson plans. For children who have not achieved proficiency, Ms. Jones will plan future lessons targeting this skill. Ms. Hernández conducts the small-group lesson in her classroom, providing each child with multiple turns to practice meaningful counting. Ms. Jones and Ms. Hernández identify children who need more work on the concept and invite them to this center often during the days or weeks that it is open. During other parts of the school day, Ms. Jones and Ms. Hernández create additional opportunities for children to practice relevant counting (e.g., counting napkins during snack time, counting out newsletters to place in mailboxes). This lesson was written in the context of Ms. Jones’ preschool classroom. We now offer some general suggestions of adaptations you can use in your own classroom. Child is able to rote count but has trouble counting while moving pennies. 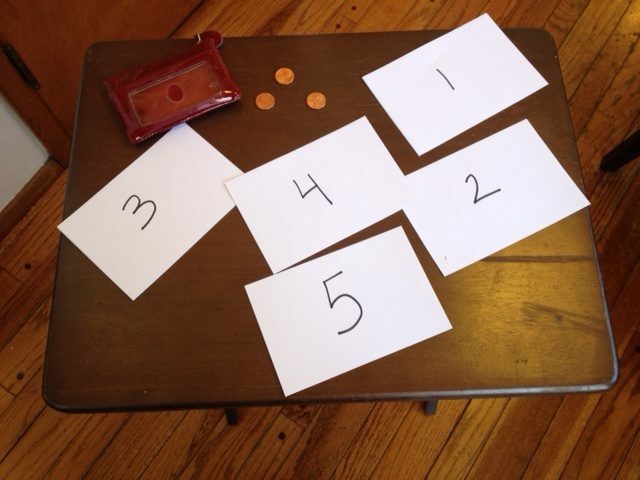 When a child is working with a price tag, the teacher places a card with a picture of the corresponding number of pennies in front of the coin purse. 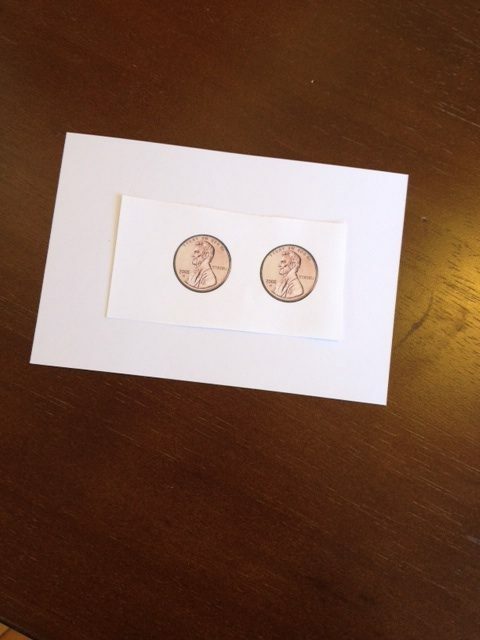 This way, the child can match pennies to the picture as he counts, helping him keep track of his work. Child speaks Spanish at home and knows numbers in Spanish from 1 to 10 and is proficient in counting 1 to 10 in Spanish. Teacher encourages child to count in Spanish during the activity and eventually supports him in adding English language counting as appropriate throughout the year. Child uses a wheelchair and has no use of her left hand but some use of her right hand. Child has had success using the classroom Smartboard for academic activities. Teacher designs a penny-counting activity on the Smartboard so the child can navigate her wheelchair to the Smartboard and use her whole hand to swipe images of pennies across the screen as she counts them. Alternatively, the child could do a penny-counting activity using a large computer monitor with a touchscreen adaptation. If either adaptation is used, one small-group center should be the Smartboard or computer. This center would be available to all children so the child requiring mobility support would be working in an inclusive center with her peers. Child has significant language delays and uses an AAC device to communicate. This can be programmed with up to four words and images at a time. AAC device option: Teacher programs the child’s AAC device with numerals 1–4. As the child counts pennies, he touches the numeral after each penny to demonstrate counting. 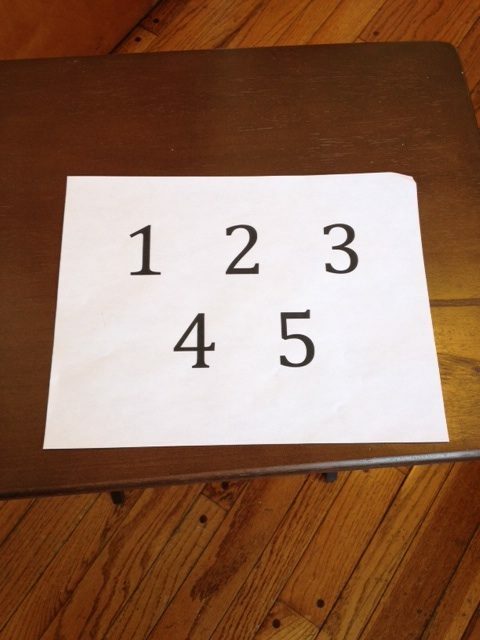 Low-tech option: Teacher provides a laminated card with the numbers 1–5 on it. The child requiring communication support can point to the numbers on the card to participate in the counting activity, and other children in the group can use the card as a prompt to recall numbers as they count. 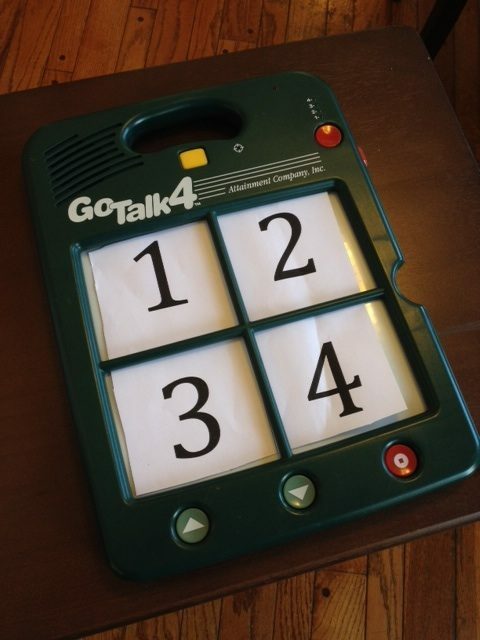 The low-tech option allows the child to work with the full set of numbers (1–5) while the AAC device only holds four icons, allowing work with numbers 1–4. 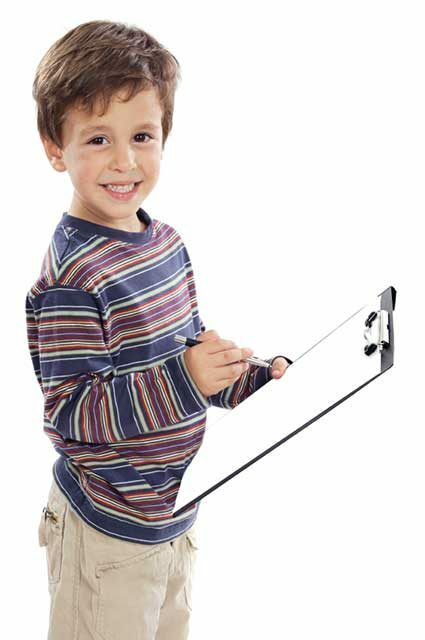 Teacher gives child a job or responsibility before activity begins (e.g., attendance taker or materials distributor). As an additional option, the teacher may provide a fidget toy for child during transition times. This lesson plan was supported, in part, by a leadership grant from the Office of Special Education Programs (Project BLEND, H325D110037) and a grant from the Illinois State Board of Education for the Illinois Early Learning Project at the University of Illinois at Urbana-Champaign (D6548). Opinions reflect those of the authors and do not necessarily reflect those of the granting agencies.